- Independently tested and rated to NIJ 0101.06 standards to defeat six (6) rounds of 7.62x51 M80 NATO Ball from 51’ at 2,780 feet per second. - Special Threat tested to defeat 5.56 x45 M193 and 5.56x45 M855/SS109 (Penetrators) at 3,100 feet per second. - Special Threat tested to defeat and 7.62x51 M80 NATO Ball (non-AP) at 3,100 feet per second. - Special Threat tested to defeat 7.62x51 Black Tip AP (Armor Piercing) at 2,800 feet per second. - Special Threat tested to defeat 5.56 x45 M193, 5.56x45 M855/SS109 (Penetrators) at 3,000 feet per second. - Special Threat tested to defeat 7.62x39, and 7.62x51 M80 NATO Ball at 2,850 feet per second. - Special Threat tested to defeat 30-06 APM2 (7.62x63mm 165gr) Armor Piercing Black Tip Rounds, and all lesser level III and III+ threats. One or more of these products are covered by one or more of the following patents. 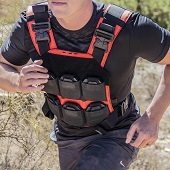 AR500 Armor® Level III Patented Advanced Shooters Cut (ASC) 11" x 14"
AR500 Armor® Level III Patented Advanced Shooters Cut (ASC) 8" x 10"
AR500 Armor® Level III Side Plate 6" x 6"
AR500 Armor® Level III Side Plate 6" x 8"